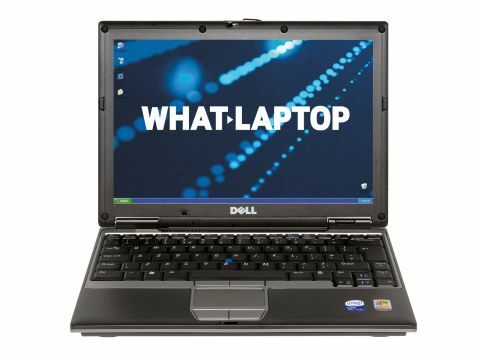 Despite limited performance, the Dell Latitude D420 (£1,291 inc. VAT) is an ultraportable that delivers impressive security, stability and connectivity for business users. Small and lightweight, this laptop is ideal for travel use. With a battery life of 198 minutes, mobility is basic. However, a long-life battery is included in the price. Adding an extra 329 minutes of mobile use, it protrudes slightly from the front of the chassis. Usability is excellent. Both a touchpad and pointing stick are fitted, offering a choice of control for onscreen actions. To make room for this, the keyboard is pushed quite far back on the chassis. However, all keys are full-sized and responsive, providing a comfortable typing action. Becoming more common on corporate laptops is the use of a widescreen TFT panel. The screen displays at a resolution of 1280 x 800 pixels, allowing ample space for all office tasks. With no glossy screen coating, reflections are eliminated, improving visibility in all conditions. Wireless broadband access is provided by an integrated HSDPA module. A Vodafone SIM card slots under the battery and high-speed internet can be accessed on the move. Tariff prices range from £25 to £95 per month, depending on your required download allowance. Web browsing, downloading email and even sharing large files is quick and easy. Vodafone's Mobile Connect software makes wirelessly connecting to the internet a simple one-click process and is accessible to even first-time users. Due to the compact chassis, an Intel ultra-low voltage processor is in place. This prevents the chassis getting too hot, but its low power leads to limited performance. Although fine for most home and office use, the Dell struggles when multi-tasking. Due to its slim design, an optical drive isn't included. CDs or DVDs can only be accessed by attaching the Dell to its included docking station. When connected, data can be written to compatible discs, although the extra weight means the dock is best suited to desktop use. For safeguarding data, a fingerprint reader is fitted for adding biometric security. Improving usability is Dell's pre-installed Quickset software. Allowing easy access to essential laptop settings, you can tailor your system to your exact needs. Although performance is low, the Dell more than compensates for this with its strong design and corporate stability. With an affordable price tag, the Latitude D420 is ideal for the mobile business user with a need for always-on connectivity.